I haven’t heard from Stephen Tarpley since I did The Dream for our little comic combo, but I just got Stephen’s Sheep Gate in the mail today and I had to throw a shout out to it. It is indie greatness. Everything one looks for in an indie comic, it’s got. Gritty over detailed art, a twisting storyline that keeps you in suspense, and especially, genuine originality. It’s not what you’d expect. The story is engaging and unpredictable. I’m sure you’ve all seen christian “sheep” comics before. This is nothing like those. So don’t worry. I can’t say too much about the story because I don’t want to give away anything, but let’s summarize this issue with “outlawed sheep and flying buffalo”. I hope I didn’t spoil too much already. Unfortunately this book is only a first issue. One of many, I’m sensing from Stephen’s after-word. The story is incomplete, but there is much to hope for. I look forward to reading more about what makes Sideburn tick, the meaning behind the reoccurring noose, the ultra-cool sheriff, and of course the buffalo. Sheep Gate is promising much from its first issue and based on the plot progress in the first 42 pages, I don’t expect to be disappointed. Stephen’s art style is great and perfect for the story atmosphere. Sadly, however, it does have the typical amature production problem of being muddy and can be a bit difficult to read. That being said, it’s not the worse. Everything is legible and understandable. It just takes a bit more time to read through in some places. The story telling has the same problem. There is a lot of energy and creativity in the paneling of Sheep Gate. Sometimes though, things get a bit out of place and the reading doesn’t go as smoothly as a reader would hope. Once again, this is not a wall to the story, merely uncomfortable footing. The story still reads well, you just have to pay a bit closer attention. Probably not an easy read for younger readers or people who may be just starting to get into comic books. The number one quarrel would have to be the fact that this is a first issue. Sure a longer story is great, but according to Stephen, the first issue was started way back in 2000. That’s a little discouraging. However, I’m no stranger to long production times and I’m sure that with enough encouragement, Stephen will come through with more issues! Unfortunately Stephen’s website is down and presumably out of date considering its URL. There is a light at the end of the tunnel, though. 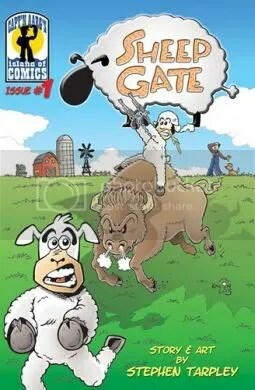 Sheep Gate can be purchased through christiancomics.net. It’s highly recommended for indie comic fans and has a gorgeous color cover by Kneon Transitt, something for everyone! So go eat up!